Our Top 5 picks! A guide to the best on campus food! In a world where fast, fresh food is the norm, Progress campus has stepped up their game to cater to its students and feed the smart minds and large appetites. The Market Place (aka Cafeteria) on the 1st floor of C Block at Progress campus has regular food options, home to Tim Hortons, Pizza Pizza, and Subway which are familiar and established brands built around a communal seating area. For those lunch rushers looking for options outside the main cafeteria, we bring you a handy list to figure out where you can get the best (and best-hidden) food. If you study at Progress, you’re in luck! And if you’ll be visiting soon, well, don’t pack yourself lunch and check out these options. 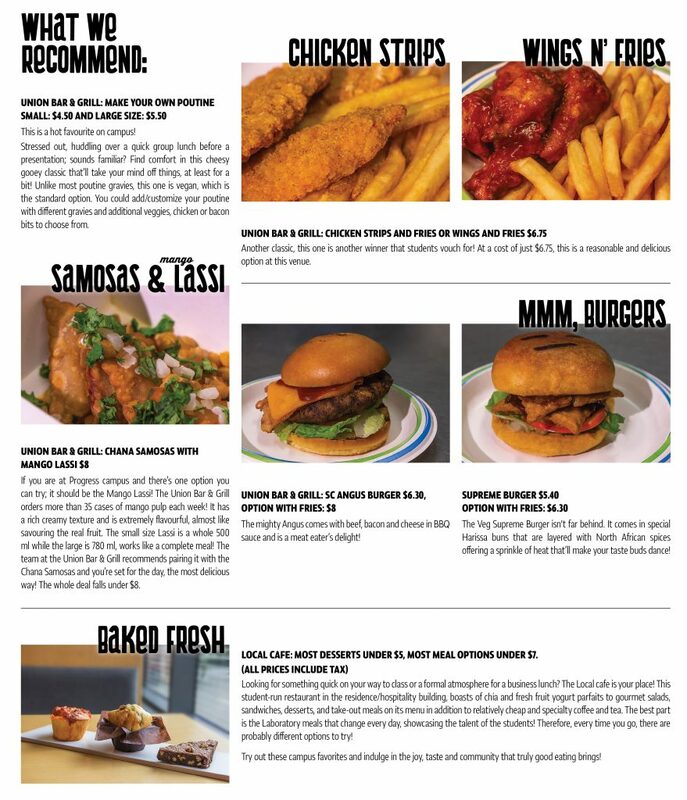 The Student Association run Union Bar & Grill has made a name for itself in the foodie circle with their great options at affordable prices. Its cafeteria style dining features fresh cooked-to-order food with hearty portions, that’ll keep you going the entire day! Another option worth exploring is the Local Cafe. If you’re looking to impress and don’t want to burn a hole in your pocket, this is the place to go. The café is situated in the Hospitality wing, also connected to the Residence building. It gives you the real fine dining feel with its restaurant style setup. Run by the students of the Culinary and Hospitality program, there’s always interesting options. This is a hot favourite on campus! Stressed out, huddling over a quick group lunch before a presentation; sounds familiar? Find comfort in this cheesy gooey classic that’ll take your mind off things, at least for a bit! Unlike most poutine gravies, this one is vegan, which is the standard option. You could add/customize your poutine with different gravies and additional veggies, chicken or bacon bits to choose from. If you are at Progress campus and there’s one option you can try; it should be the Mango Lassi! The Union Bar & Grill orders more than 35 cases of mango pulp each week! It has a rich creamy texture and is extremely flavourful, almost like savouring the real fruit. The small size Lassi is a whole 500 ml while the large is 780 ml, works like a complete meal! The team at the Union Bar & Grill recommends pairing it with the Chana Samosas and you’re set for the day, the most delicious way! The whole deal falls under $8. Another classic, this one is another winner that students vouch for! At a cost of just $6.75, this is a reasonable and delicious option at this venue. The mighty Angus comes with beef, bacon and cheese in BBQ sauce and is a meat eater’s delight! The Veg Supreme Burger isn’t far behind. It comes in special Harissa buns that are layered with North African spices offering a sprinkle of heat that’ll make your taste buds dance! Looking for something quick on your way to class or a formal atmosphere for a business lunch? The Local cafe is your place! This student-run restaurant in the residence/hospitality building, boasts of chia and fresh fruit yogurt parfaits to gourmet salads, sandwiches, desserts, and take-out meals on its menu in addition to relatively cheap and specialty coffee and tea. The best part is the Laboratory meals that change every day, showcasing the talent of the students! Therefore, every time you go, there are probably different options to try! 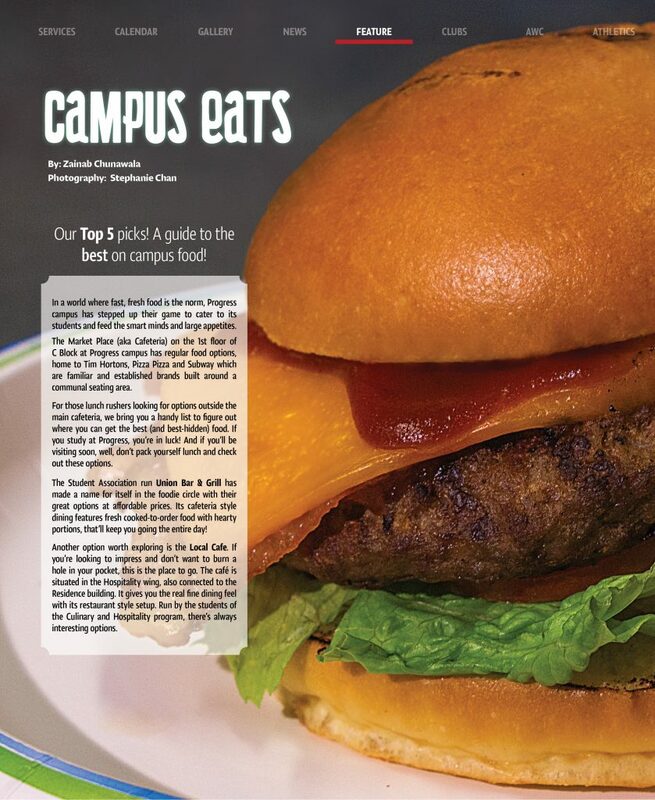 Try out these campus favourites and indulge in the joy, taste and community that truly good eating brings!